It’s extremely rare for the final production version of a new car to so closely resemble its motor show concept. The Infiniti Q60 is one such vehicle. Drop-dead gorgeous – especially in Dynamic Sunstone Red – the big question is whether this svelte coupe is simply eye candy or a genuine rival to the Teutonic trio that is the Audi A5, Mercedes-Benz C-Class Coupe and BMW 4 Series Coupe. 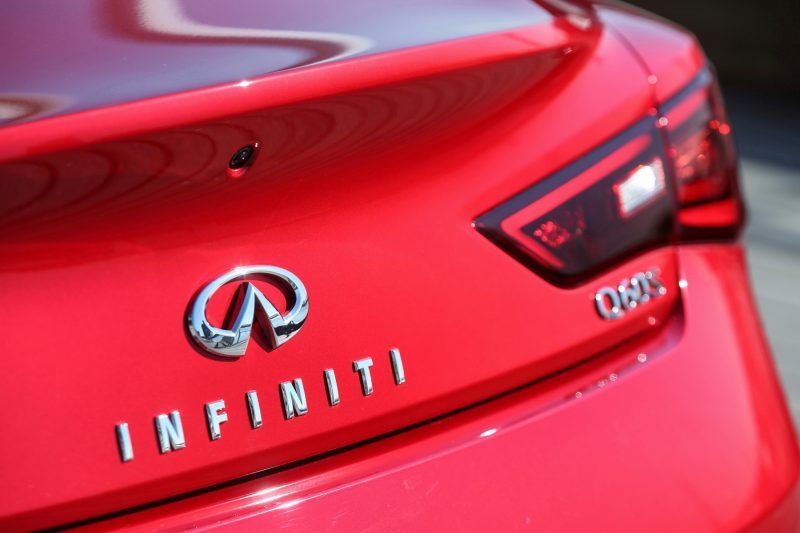 Infiniti is Nissan’s luxury and performance brand, and though it has a relatively low profile in the UK, it’s a big player elsewhere. America is its largest market, while it’s experiencing its biggest growth in China. The Infiniti Q60 is essentially a two-door evolution of the hidden gem that is the Q50 saloon. The muscular front end is very similar to the Q50, but from then on its sculpted sides and strong shoulder line taper back to a classic coupe rear. 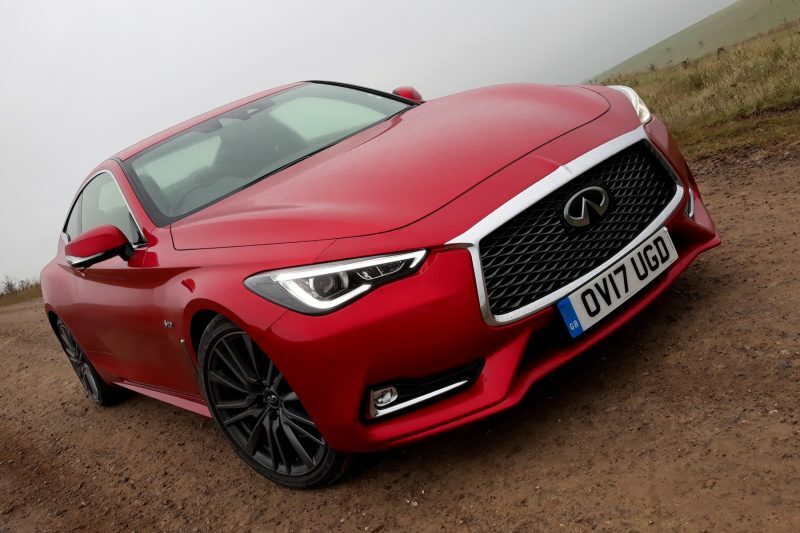 Priced from £34,300, there are four trim levels – an entry-level Q60 Premium and Premium Tech (both 2.0-litre petrol) and flagship Q60S Sport and Q60S Sport Tech (both V6 3.0-litre). Even though it’s technically a 2+2, there’s so little leg and headroom in the back that it’s only really suitable for children, so it’s effectively a two-seater. Thankfully, from a practical point of view, there’s plenty of cabin space up front, while the boot can hold a decent 342 litres of luggage. 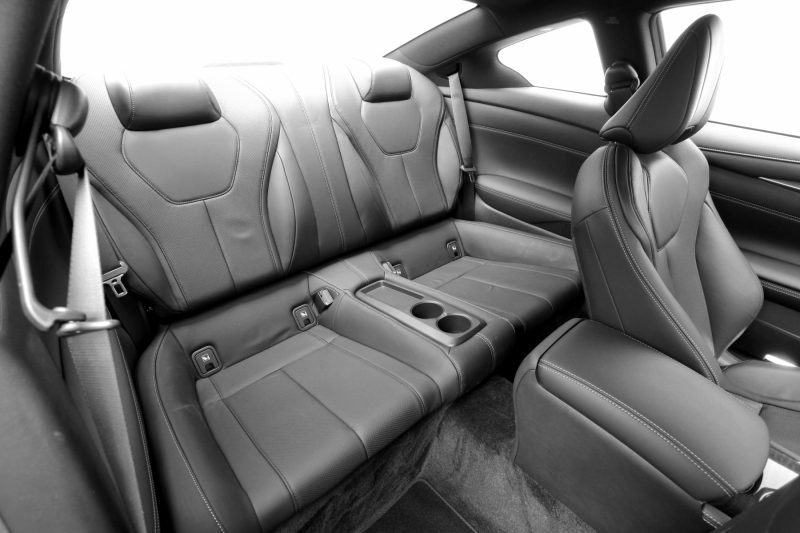 It’s nicely put together with quality materials used inside, the seats are comfortable and supportive, while the big doors close with a satisfying clunk. There are traditional dials ahead of the driver, the centre console is dominated by an integrated 8.0-inch touchscreen, sitting above a slightly unnecessary second info screen, plus a welcome scattering of shortcuts and buttons. 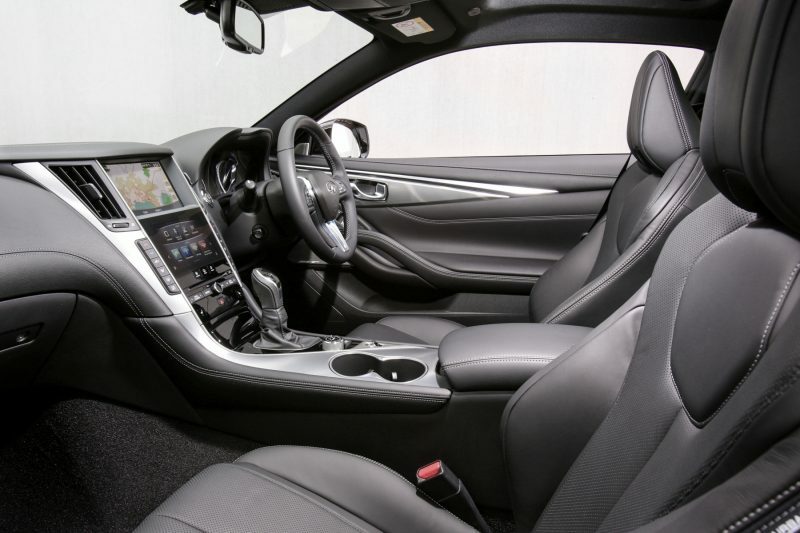 However, the Q60 isn’t just about its premium looks and feel – it’s packed full of cutting-edge tech, driver safety aids and, of course, fully connected. For instance, there’s Infiniti’s new Dynamic Digital Suspension, which is “engineered to offer excellent handling responses and agility and enhanced ride comfort”, plus Direct Adaptive Steering which “offers high levels of steering feel and feedback”. Safety features include autonomous emergency braking, a lane-departure warning and adaptive cruise control. There are two petrol engines – a 2.0-litre turbo producing 205bhp and a 3.0-litre V6 twin-turbo with an impressive 400bhp, both of which are mated to a seven-speed automatic as standard. Unlike the Q50, there’s no hybrid or diesel option. The 2,0-litre is rear-wheel drive, capable of 0-62mph in 7.3 seconds, a top speed of 146mph, 41.5mpg and CO2 emissions of 156g/km. 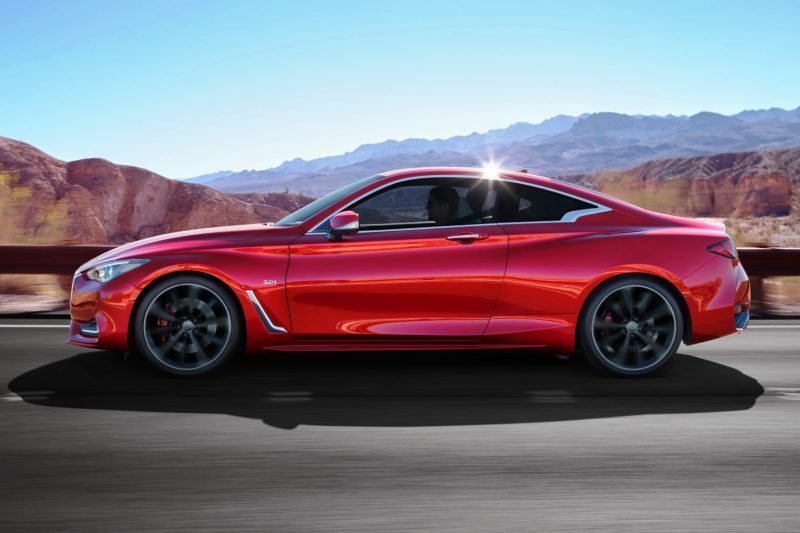 The more powerful Q60S is all-wheel drive, can hit 62mph from standstill in 5.0 seconds, has a top speed of 155mph, fuel economy is a thirsty 30.1mpg and CO2 emissions are 210g/km. I tested the top-of-the range Q60S Sport Tech, which starts at £47,325. Step inside and the driver’s seat glides to your personal pre-set position, making the low-slung cabin feel very special indeed, even before you hit the Start button. Fire up the V6 and there’s a satisfying snarl, which intensifies the faster you accelerate, though it will also purr when cruising. You can also choose between various drive modes (standard, snow, eco, sport, sport+’ or personal options, allowing you to further tailor your Q60 experience by tuning the steering, engine and suspension inputs). I was more than happy in Sport mode, revelling in the blistering performance and remarkable AWD traction. Now we come to the elephant in the room – the Q60’s Directive Adaptive Steering system. It’s a second-generation version, following criticism of the original set-up in the Q50 – and it’s the only drive-by-wire arrangement available on the market. There are six modes for the steering, including Sport+ and Dynamic+, delivering ultra sharp responses, but – controversially- with next to no traditional feedback. So, for instance, on more challenging roads with lots of tight turns the car is very easy to handle, while on the motorway it will stiffen up. The system certainly takes some getting used to, but it shouldn’t be a deal-breaker and it’s probably the future as we enter a new world of autonomous driving. If you can live with the steering, the Q60 is surprisingly agile for a relatively heavy car. Despite its beautiful lines and awesome traction, it should still be treated with respect, but it will also cruise effortlessly. In fact, the Q60 is a car to be enjoyed on various levels, whether it’s simply admiring its beauty or exploring the unique driving experience it offers. Verdict: The Infiniti Q60S coupe is a worthy rival to the German premium brands. Fast, well-equipped, oozing quality and boasting striking looks, it’s definitely a car worth considering if you want to stand out from the crowd and you favour discreet performance.